Jason P. Waguespack is the current Managing Director of the Firm. 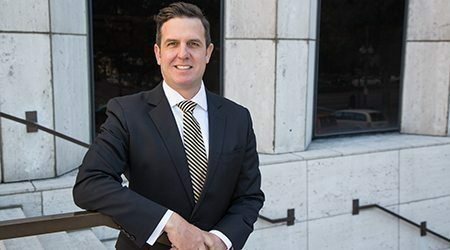 Although Jason spends a majority of his time overseeing the operations of the Firm, he still maintains an active law practice based in New Orleans and Houston that focuses primarily on litigation and arbitration related to all aspects of maritime and international law. He concentrates in the representation of owners, charterers, operators, P&I clubs and other marine insurers in all types of marine casualty losses and contract disputes, including collisions, cargo claims, charter party disputes, regulatory and environmental matters, and personal injuries. In addition to maritime and international law, Jason has extensive experience in corporate law and insurance defense, particularly property damage claims. He serves as national counsel to several clients with ongoing international interests, advising them not only on arbitration and litigation matters, but also on transactional matters related to business organization, operation, formation, and acquisition, as well as sales, supply, service, and carriage arrangements. He has multiple reported cases and often serves as a lecturer at various marine and insurance seminars. He has been honored by his peers with an AV rating in Martindale Hubbell for his preeminence in the law, and is the recipient of many professional awards and distinctions, including being named a Louisiana Super Lawyer multiple times by Louisiana Life Magazine, a New Orleans Top Lawyer multiple times by New Orleans Magazine, and receiving the Leadership in the Law medal from New Orleans CityBusiness. Jason is licensed to practice in all Louisiana state and federal courts. He is also admitted to and has practiced before federal district courts in Texas, Mississippi, Illinois, and Florida, the United States Courts of Appeals for the Fifth, Eleventh, and Second Circuits, and the United States Supreme Court. Jason is a member of the Louisiana State, New Orleans, and Federal Bar Associations, a Proctor in the Maritime Law Association of the United States, a member of the Southeastern Admiralty Law Institute, a Fellow in the Louisiana Bar Foundation at the New Orleans Bar Foundation, a member of the Louisiana Association of Defense counsel, and a member of the Mariner’s Club for the Port of New Orleans and the Propeller Club for the Port of New Orleans. In addition to being the Managing Director of Galloway Johnson, Jason serves in leadership positions in multiple professional and civic organizations, including as the President-Elect of the New Orleans Bar Association; a member of the Board of Directors and President-Elect of NOAGE, Inc., an organization established to assist elders; a member of the Board of Directors of Project Lazarus, a transitional housing organization operated by the Archdiocese of New Orleans; and a member of the International Business Committee of the World Trade Center of the City of New Orleans. He is a past member of the Board of Zoning Adjustments of the City of New Orleans and a past member of the City of New Orleans Zoning and Technical Advisory Committee during the drafting of the City’s Master Plan for the 21st Century. Jason is an associate professor of law at Tulane University School of Law. There, he teaches the course on charter parties to upperclassmen and graduate students. He is also a member of the adjunct faculty at the Tulane University A.B. Freeman School of Business, where he teaches a course on international business law, with a focus on international transactions and transportation. He serves on the board of advisors of the Loyola University School of Law’s Maritime Law Journal and was a past member of the board of advisors of the Maritime Law Practitioner. He enjoys working with his students and has served as a mentor to several after they graduated and started their careers. Jason is dedicated to historic preservation and the support of the arts in New Orleans, and is a member of the Library Society of the New Orleans Public Library Foundation; a member of the Laussat Society of the Historic New Orleans Collection; a member of the President’s Circle of the Preservation Resource Center of New Orleans; a Fellow with the New Orleans Museum of Art; a member of the Collectors’ Club of the Contemporary Arts Center; a member of the Richardson Society of the Ogden Museum of Southern Art; and a member of the Louisiana Supreme Court Historical Society.